If you’ve been on Facebook lately, there’s a good chance you’ve come across some familiar faces on your timeline. 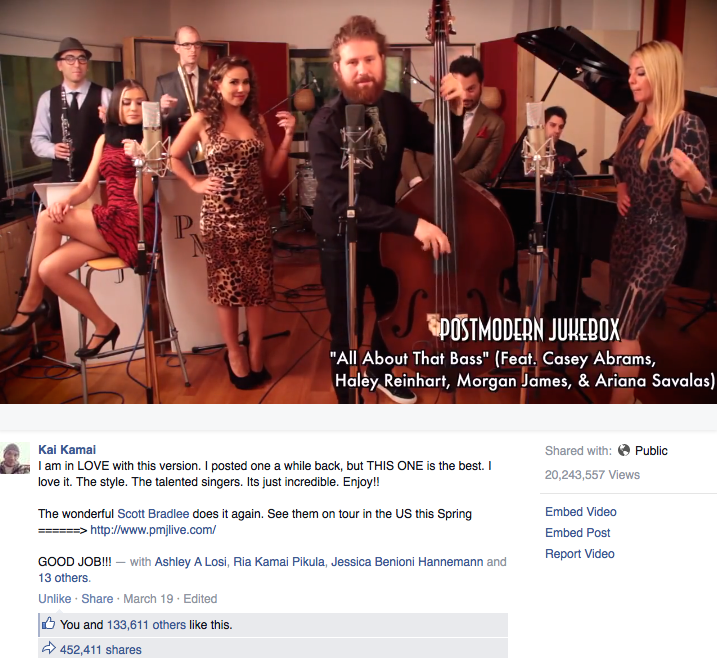 Postmodern Jukebox’s recent new cover of “All About That Bass” was uploaded to the website, and has now gone viral. On Facebook, the video currently has 20,243,557 views (and counting). 20 MILLION! Along with that it has 130,000+ likes, and over 450,000 shares. (It’s getting roughly 10 new shares per minute!). The video also just reached 1 million views on YouTube as of yesterday. This version of the song is currently sitting at #1 on the iTunes Jazz charts. Own it for a buck 29 here! I couldn’t be happier to see a video involving Haley blow up, it’s helping her get some of the recognition she deserves.